Gross sexism aside, the menu sounds pretty delicious. Australian Prime Minister Julia Gillard is a candidate under attack from all sides. She’s at risk in her own Australian Labor Party by the resurgent Kevin Rudd, and she’s under attack from her opponents in the Liberal National Party as well. However, one LNP fundraiser might have gone just a bit too far. At a fundraising dinner for candidate Mal Brough in Queensland, an insulting menu for the meal was published that mocked Gillard, Rudd, and Australia’s version of the Green Party. It’s not just the mockery, but the sexism that’s the problem. The menu was captured on film and has since gone viral, kicking off a nice little political scandal for the Aussies. The menu proved to be an equal opportunity mocker. 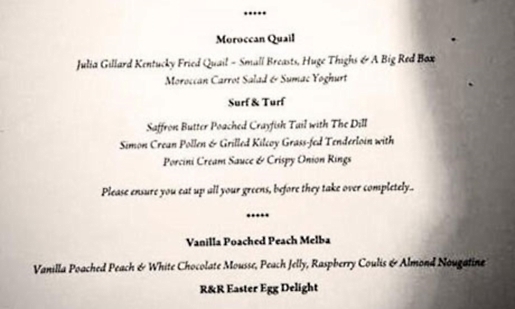 Gillard got it the worst, with the menu offering “Julia Gillard Kentucky Fried Quail – Small breasts, huge thighs, and a big red box”. It also mocked former Prime Minister Kevin Rudd (who Gillard took over for in 2010) and the Green Party as a whole. For their part, the LNP maintain they didn’t actually see the menu in question and that it was the creation of one of the chefs catering the dinner.